An island metropolis located in southwestern Québec, Montréal is the second largest French-speaking city in the world after Paris. We discover the top 10 things to do in Montréal - a cool cosmopolitan city that brings a chic European vibe to Canada's East Coast. Where: 900 René-Lévesque Boulevard West, in the heart of downtown. What: Fabulously located atop VIA Rail's Gare Centrale, Fairmont The Queen Elizabeth (Le Reine Élizabeth in French) boasts 1,037 guestrooms, a state-of-the-art Zen-like spa and three distinctive restaurants: Les Voyageurs Bar, Le Montréalais Bistrot-Bar and the award-winning Beaver Club. Affectionately known locally as ‘the Queen E’, this iconic Montréal hotel is most famous for hosting John Lennon and Yoko Ono’s second staged ‘bed-in’ to promote world peace; the pair recorded Give Peace a Chance here between May 26 and June 2, 1969. Highlights: After their weeklong ‘Bed-In For Peace’ at the Amsterdam Hilton, Lennon and Ono moved to The Queen Elizabeth to set up camp in Suite 1742; an event that captured worldwide attention. Guests can stay in the now-named John Lennon Suite where walls are adorned with photographs of the famous duo, press clippings and framed gold records of Give Peace a Chance. The luxury one-night ‘Bed-In for Peace Package’ costs from £510 per night (based on two sharing) and includes souvenir pyjamas like those worn by John and Yoko, a lyric sheet of the peace anthem and breakfast in bed. Where: Place des Festivals, just steps from Place-des-Arts Metro station. What: Founded in 1983, Just For Laughs is the largest and most prestigious comedy festival in the world. Held annually in Montréal in July it takes comedy very seriously; on average two million attend this side-splitting free outdoor extravaganza which hosts around 1700 artists from 19 countries and offers over 1,600 performances. Highlights: This year marks the 30th Anniversary of the Just For Laughs Comedy Festival which runs from 10 July to 28 July 2013 and includes stand-up performances, comedy sketches, theatre productions, animation, film shorts and industry seminars. Aside from the comedy overdose, there are also plenty of thrilling galas, parades, street dancers, circus acts, acrobats, pantomimes, ventriloquists and mime artists to spice up the festivities. This much-celebrated showcase of hilarity has welcomed comedy greats such as John Cleese, Bill Cosby, Whoopi Goldberg, Jim Carrey, Jerry Seinfeld, Chris Rock, Drew Carey, Rowan Atkinson and more. It is also a huge deal for talent scouts, booking agents, managers and producers in the comedy industry on the lookout for the next generation of superstar comics. Visit the Just For Laughs website for 2013 event listings. Where: 110 Notre-Dame Street West, at the corner of Saint Sulpice Street facing Place d'Armes. What: Towering over the cobblestone streets of Vieux-Montréal (Old Montréal) this awe-inspiring 19th-century Gothic Revival-style church was modelled on the Sainte-Chapelle in Paris. Designed by Protestant American-Irish architect James O’Donnell it was built between 1824 and 1829, hailed as the largest church in North America. O'Donnell was so overwhelmed by his masterpiece that he converted to Catholicism on his deathbed and is the only person to be buried in the crypt. Highlights: Nothing else in Montréal exudes the wow-factor like Basilique Notre-Dame; from its 228-foot twin exterior towers to its elaborate gilded and painted walnut-wood carvings, exquisite stained-glass windows and tens of thousands of 24-carat gold stars that stud the vaulted midnight-blue ceiling. Most fascinating is the 12-ton Jean-Baptiste bell, a 7,000-pipe Casavant organ and the stunning pulpit with its intricately curving staircase. Built to accommodate 4,000 worshippers, the basilica is open to visitors between Monday and Saturday from 8am to early evening and on Sunday afternoons. Admission costs £3 for adults and £2.50 for children aged 7-17. Where: Dominating the skyline of Montréal. What: Montréal was built around a mountain and named for Mount Royal (or mont Réal) by French explorer Jacques Cartier in 1535. Believed by many to be an extinct volcano, this tiny mountain overlooking the city is just 234m high, but still makes for a pretty demanding climb. The summit has a lookout and superb 343-acre public park designed in 1876 by American landscape architect Frederick Law Olmsted, famous for co-creating New York’s Central Park. Highlights: It takes around 45 minutes to reach the summit of Mount Royal, or ‘The Mountain’ as it is affectionately known; there are several walking paths and a network of dedicated trails for cyclists. Once at the top, head to the 1930’s Kondiaronk (Chalet) for the most incredible panoramic views of the city and the mighty St. Lawrence River. Also worth visiting is Beaver Lake, a man-made lake complete with a playground, a pavilion and bistro-restaurant, and Smith House, a heritage building constructed in 1858 that is now an education centre devoted to the conservation of Mont Royal. The summit’s most iconic monument is the 103-feet-tall illuminated Mount Royal Cross which has been revised extensively over the centuries; it was first erected here in 1643 by the city’s founder, Paul de Chomedey de Maisonneuve, to thank God for saving Montréal from floods. Where: Set beneath the downtown area. What: Underground City (officially known as RÉSO or La Ville Souterraine) is the world’s largest subterranean city area. Boasting 20 miles of interconnected tunnels, it is filled with shopping malls, office buildings, restaurants, apartments, hotels, train stations and even a regional bus terminal. Designed to avoid the temperatures in Montréal that dip well below zero during the winter months, these climate-controlled tunnels are accessible from over 200 entrance points located around the city. Highlights: Shopaholics can browse the racks in over 1,700 stores without ever needing to brave the elements; this expansive series of tunnels also provides refuge from the heat in the summer months. Stores featured range from one-off boutiques to the usual suspects like Gap, Levis, Old Navy and Stitches, a popular Canadian teen fashion retailer. The passageways in the Underground City link to all the Montréal Metros; since they are used by around 500,000 people every day they are best avoided during rush hour. A map is essential as this sprawling area is hard (but tons of fun) to navigate. Where: 4101 Sherbrooke Street East in Maisonneuve Park, facing the Olympic Stadium. What: The vision of Quebec-born teacher and botanist Brother Marie-Victorin, Jardin Botanique de Montréal (Botanical Gardens of Montréal) opened in 1931 at the height of the Great Depression. Designed as a garden that could be shared with the people of Montréal, the priest saw the wonders of nature as a proof of God's existence and hired many of Montréal's out-of-work citizens to plant and build his dream for an 75-acre botanical oasis in the heart of the city. Highlights: Boasting an extensive collection of 22,000 plant species and cultivars, 10 exhibition greenhouses, Maison de l’Arbre (Tree House) and 30 thematic gardens, this is the third-largest botanical garden in the world after London’s Kew Gardens and Berlin’s Botanischer Garten. Most appealing is the Japanese Garden that spreads out over 2.5 hectares. Designed to showcase the Japanese philosophy of landscaping it includes traditional pavilions, waterfalls, streams, a tearoom and an art gallery; the bonsai ‘forest’ here is the largest outside Asia. Equally stunning in the Chinese Garden where the ornamental penjing trees from Hong Kong are around 100 years old. Admission is £12 for adults; £6 for children aged 5-17. What: Founded in 1860 by a group of wealthy art collectors who set up the Art Association of Montréal, the illustrious Montréal Museum of Fine Arts (MMFA) is Canada's oldest museum. Housing almost 35,000 artworks from antiquity to the present day, its permanent collection is always free to the public. Paid admission is required for special temporary exhibitions that run throughout the year. Highlights include works by luminaries such as Monet, Picasso, Renoir, Matisse, Cézanne, Rembrandt and Dalí. Dale Chihuly: A Master of Contemporary Glass (8 June to 20 October 2013) and Splendoure Venezia: Art and Music from the Renaissance to the Baroque in the Serenissima (12 October 2013 to 19 January 2014). Where: 355 Rue Saint Jacques, in the heart of Old Montréal. What: Housed in an 1870’s building that was once a merchant bank, the graceful and gorgeously restored Hôtel Le St-James is an eclectic and eye-pleasing five-star boutique hotel with 61 rooms and suites. Each guestroom is individually designed and sumptuously furnished with fine artworks, antiques, lavish fabrics and huge wooden beds; spacious bathrooms are lined with Italian marble. Highlights: Most exquisite is Le Spa which is nestled in the former vintage bank’s vault - the rustic stone wall was once part of the fortification of the City of Montréal. With its original brick ceiling and heated onyx floor, this candlelit sanctuary of serenity is the perfect setting for customised treatments that include couples massages and hydrotherapy. Located in what used to be the bank’s lobby, the hotel’s acclaimed XO Le Restaurant was named ‘the most striking dining room in Canada’ by The Toronto Star in February 2012. The surroundings exude opulence with Corinthian columns and gilded metal balustrades whilst the menu offers modern and innovative cuisine under the direction of celebrated chef Michele Mercuri. Expect a fair few A-list sightings; Madonna, Mick Jagger, Johnny Depp and Elton John have all checked in. Rooms from £185 per night. Where: 275 Notre-Dame Street East, between Place Jacques-Cartier and Champ de Mars. What: Built between 1872 and 1878, the spectacular five-storey Montréal City Hall (known in French as Hôtel de Ville) has been hailed as one of the best examples of the Second Empire architectural style in Canada. The building survived a severe fire in 1922 and became a designated Canadian National Historic Site in 1984 - it currently serves as the city’s administrative headquarters. Highlights: City Hall is most famous for its balcony on which French president Charles de Gaulle gave his infamous and controversial ‘Vive le Québec libre!’ speech on 24 July 1967. The building is defined by its symmetrical façade which is dominated by a two-storey entrance pavilion and embellished with metal-clad mansard roofs, ornate balconies, grand turrets, elaborate chimneys and fine masonry work. Most impressive is the Hall of Honour, a striking room that features portraits of Montréal's former mayors and also houses a magnificent French bronze and glass chandelier weighing over 2,000 pounds. Although many areas are off-limits to the public, visitors can enjoy a free informative 45-minute guided tour which takes place on weekdays between May and October. Where: 4801 Pierre De Courbertin Street in Montréal’s Olympic Village. What: Following the 2011 closure of the Montréal Planetarium (formerly known as the Dow Planetarium), the high-tech £30 million Rio Tinto Alcan Planetarium opened in a purpose-built location at the Olympic Park on 6 April 2013. Also known as Space for Life, this boldly-designed three-level structure is the largest natural science museum complex in Canada and around four times larger than its downtown predecessor. Highlights: Offering star-struck visitors a unique cosmic experience, the Rio Tinto Alcan Planetarium presents two new dome-shaped installations; Chaos Theatre and Milky Way Theatre. The former presents a creative and artistic view of the cosmos to an audience sat on beanbags whilst the latter teaches about the constellations and different elements of the universe with the help of a scientific interpreter. Another star attraction is Exo: Our search for Life in the Universe, an exhibit dedicated to scientific exploration through interactive terminals, videos and multimedia games. One section of the exhibition is a real geology lab with a vast collection of meteorites, including the oldest piece of the solar system. Shows are recommended for children aged seven upwards. Admission is £12 for adults; £6 for children aged 5-17. 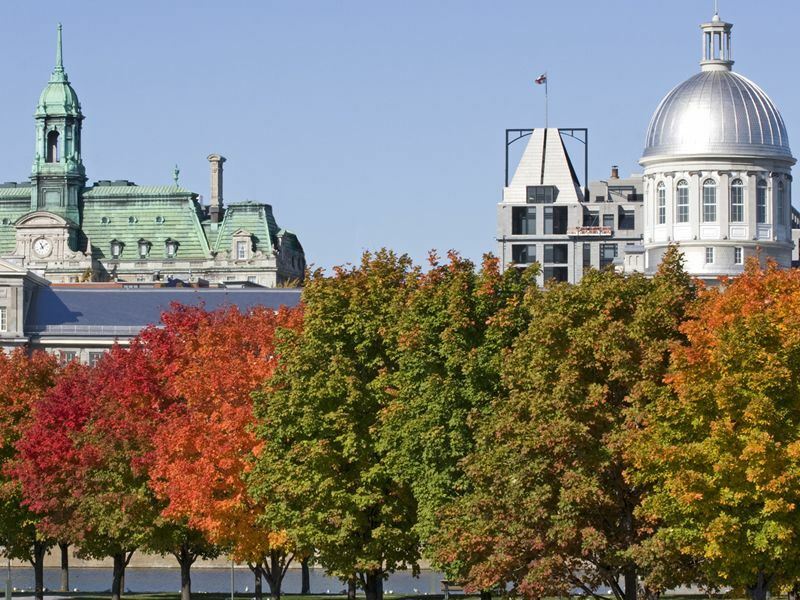 More information and to book: Visit Montreal and explore the museums, parks and attractions that this city one of the most diverse, beautiful and exciting places in Canada.